Not every concrete repair involves a call to your favorite contractor. Some concrete slab repairs can be done by yourself in an afternoon. The most important part of taking care of concrete damage is determining what the problem is. There are three common types of concrete damage that you can probably take care of yourself. 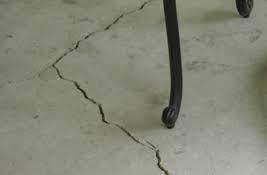 Plastic-Shrinkage Cracks: These cracks can be found evenly distributed across the slab and usually run mid-depth into the concrete. They are short in comparison with other types of cracks. These cracks usually develop during the curing stage as the concrete surface dries quicker than the concrete underneath it. Scaling: A concrete surface may be covered with small pockmarks. These blemishes can expose the aggregate underneath the surface. Hairline Cracks: As their name implies, these cracks are very thin but don’t let that deceive you, the cracks can be very deep. These cracks can occur when the slab settles during curing. These cracks can get bigger, so you need to keep an eye on them. When you are able to determine the type of damage your concrete has, you’ll know what you need to make the repair. Always follow the directions on the package for whatever product you use, but there are a few things that are pretty common when it comes to concrete repair. You’ll need a quality nylon brush to wipe area free of dust and debris. Don’t skimp on the brush, as this first step is also one of the most important ones to do correctly and thoroughly. You may also need a good hammer and chisel to remove any damaged or loose concrete around the area in question. We recommend pressure washing the area before applying any products to the concrete, but you need to make sure that the concrete is completely dry. Even a little moisture can make a problem even worse than it was. Depending on the type of product, you may need a putty knife or trowel to shape and smooth the material used to repair the concrete damage. In other instances, the product may be dispensed from a squeeze bottle or other method, so no additional tools may be required. There are a variety of products on the market and you really need to do your research to make sure that you have not only a quality product but the right one for your particular problem. If the cracks in your slab are between 1/4″ to 1/2″ deep, then you should use a trusted concrete crack filler. Make sure your product is able to be used either indoors or outdoors, depending on the location of the slab. The crack filler should protect the crack from water penetration, regardless of the location of the concrete. Water can be inside or outside. If the crack is bigger than 1/2″ than you will probably want a cement patcher. This takes a little more time to set, but it is stronger and able to withstand more pressure than a filler. If the repair isn’t done correctly or thoroughly, it may lead to larger problems. It doesn’t take a large crack for water to enter the slab and cause problems. Rain, snow, water from washing a car, or other sources can enter the crack and cause erosion. The water can also expand and contract with changes in temperature, making a crack even worse than it was. If you aren’t sure that you can do the job completely, you may be better calling on a professional like Polyjacking.com to make sure that the crack is taken care, in addition to whatever is causing the crack.